Tim and I just returned from an amazing weekend spent in Little Rock, AR. We were both completely overwhelmed (in the best possible way) by how warm and welcoming the community there is. It's very apparent just how invested everyone in Little Rock is in growing their community responsibly, and promoting the plethora of good things they have going on there. We were able to stay in the stunning downtown studio of artist Marianne Hennigar, which is conveniently located right in the middle of a bustling downtown area. I taught two sold out workshops at South Main Creative. South Main Creative is housed in a large historic building in the SoMa neighborhood of Little Rock. Under the guidance of owner Valerie Wingert (who is indescribably fabulous), the walls are filled with original artwork, antiques and vintage goodness. At any given time, more than 40 artists can be represented among the booths inside, carefully chosen by a curatorial committee. If you're in the area, it's a must! Both workshops were filled with wonderful groups, who created such distinct pieces. 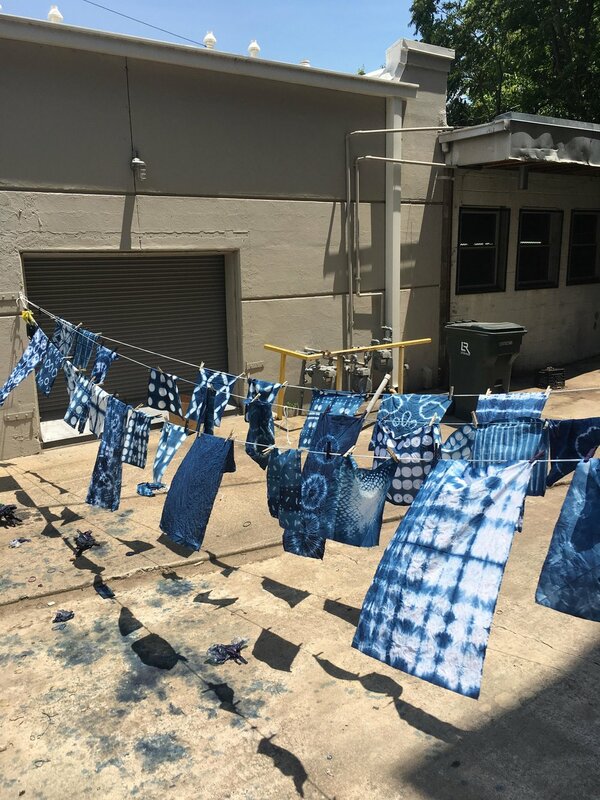 Many of the students were artists themselves, and it's always a treat to see how artists incorporate indigo and dyeing into their existing practices. 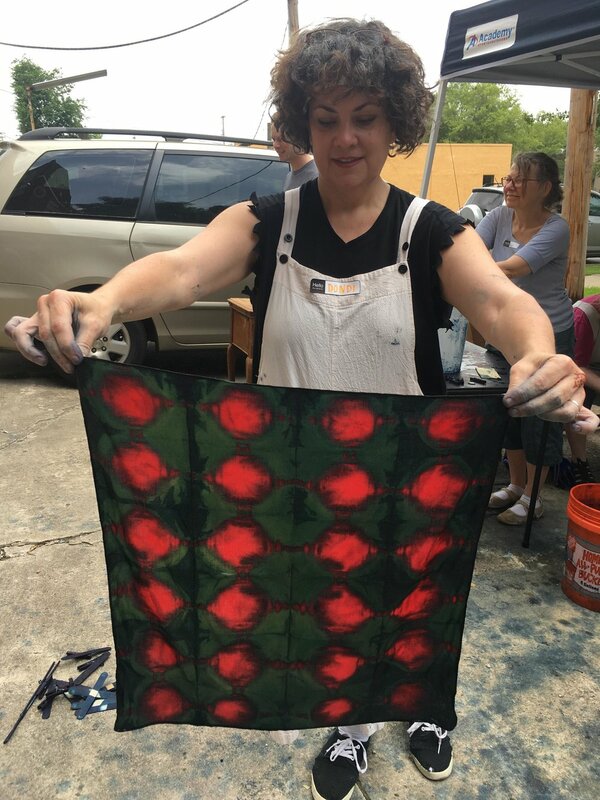 One student, Melissa Gill, is Associate Professor of Drawing and Printmaking and Art Department Chair at Hendrix College in Arkansas. The way she layered her existing work with indigo was fascinating to see. Another Little Rock artist, Hannah Lawrence, showing off her beautiful work. Day 2 was mostly comprised of artists who have space within South Main Creative, and they were a wild, hilariously fun group. Nothing was held back--people dyed their hair, shoes, and even their husband's underwear. We all had such a blast. 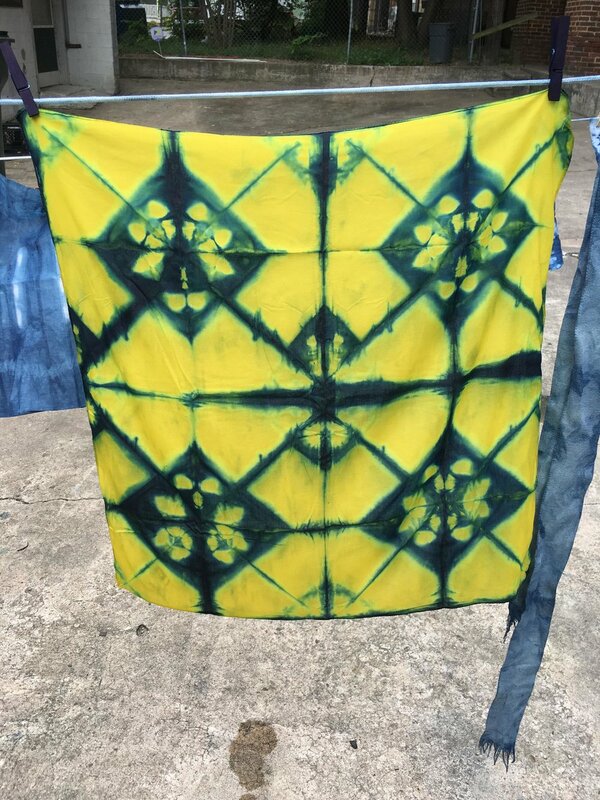 Dondi Warren, who makes art under her own name as well as Delta Gilt, experiemented extensively with overdyeing colored cotton fabric, with really lovely results.. The community also turned out for a packed-house concert for Tim Higgins, hosted at the beautiful New Deal Studio + Gallery. The second level is a beautifully restored gallery and performance space, with the basement acting as a co-op and fabrication space for artists, woodworkers and metal workers. Tim and I are really trying to unite our traveling efforts, with me booking workshops and him booking coordinating concerts and house shows in that same city. We're still getting a handle on the best ways for us to do that, and this was one of our most successful attempts, and it really showed how united the creative community is in Little Rock. We can't wait to return to Little Rock in the fall, and hopefully stay a bit longer next time. Stay tuned!